January 22nd 2008. On this day, Hollywood mourns a talented young actor’s life cut tragically short, after the body of 28-year-old Heath Ledger is found by his masseuse and housekeeper on the floor of his rented apartment in the SoHo neighborhood of New York City. Best known for his Academy Award-nominated turn as the closeted gay cowboy Ennis Del Mar in the director Ang Lee’s acclaimed Brokeback Mountain (2005), Ledger was a former child actor from Australia who first became known to American audiences in the 1999 teen comedy 10 Things I Hate About You. He later passed up other teen comedies and was rewarded with a big break when he landed the role of Mel Gibson’s son in the Revolutionary War drama The Patriot (2000). After appearing in the well-reviewed Monster’s Ball (2001), Ledger starred in two critical and commercial flops, A Knight’s Tale (2001) and The Four Feathers (2002). He roared back in 2005, with lead roles in no fewer than four films, including Casanova, in which he played the title role. It was Brokeback Mountain, however, that truly made Ledger a star and earned him comparisons to acting greats such as Marlon Brando. Ledger lost the Best Actor Oscar to Philip Seymour Hoffman (Capote) but Brokeback Mountain cemented his reputation as an A-list actor and a fixture in the pages of celebrity-obsessed magazines. This last role--which he fulfilled uneasily--was intensified by his relationship with the actress Michelle Williams, whom he met on the set of Brokeback Mountain. The couple had a daughter, Matilda, born in October 2005, and were often photographed in various scenes of domestic bliss. In September 2007, however, Ledger and Williams announced they were separating, and Ledger moved from their house in Brooklyn to the rented SoHo apartment. Though his personal life might have been in turmoil, Ledger’s professional life was flourishing in the months before his death. Near the end of 2007, he was in London filming Terry Gilliam’s The Imaginarium of Doctor Parnassus. 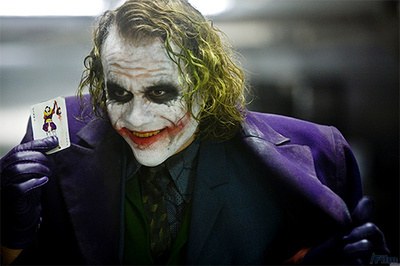 In addition to a role as one of several Bob Dylan alter egos in Todd Haynes’ I’m Not There, he had also recently finished work on The Dark Knight, the latest Batman film, in which Ledger played a younger version of the Joker, the villainous role originated by Jack Nicholson. In interviews that would be scrutinized exhaustively after his death, the actor admitted that the Joker role had been difficult for him and that he had been using prescription drugs to manage recurring bouts of stress and insomnia. Soon after the masseuse and housekeeper discovered Ledger’s body, emergency crews arrived on the scene but were unable to revive him. Media speculation about his possible illegal drug use intensified over the next two weeks, until on February 8, the New York City Medical Examiner’s Office released the results of toxicology tests performed on Ledger’s body. The report stated that he died of an accidental “abuse of prescription medications” that included commonly known painkillers, anti-anxiety drugs and sleeping pills. After memorial services in New York and Los Angeles, Ledger’s family took his body back to their native Australia; he is buried next to his grandparents, in his hometown of Perth.